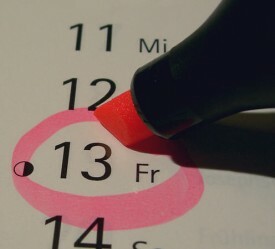 Many consider Friday the 13th an "unlucky day" - to the point of expecting bad luck, or not taking any risks or chances (such as flights, business deals, relationships, any major decisions, or even driving). According to the Merriam-Webster dictionary, luck is defined as: a force that brings good fortune or adversity ; the events or circumstances that operate for or against an individual ; the things that happen to a person because of chance : the accidental way things happen without being planned. To be "unlucky" is to be marked by adversity or failure: having or causing bad luck. That not being the case, it does make for a great excuse. An excuse not to pursue a better life, not to take risks, not to push yourself outside your comfort zone. Ultimately, not to succeed - and to be able to blame life, luck or circumstances for your lack of success. I've been "accused" of being Lucky. Some days I laugh about it, other days it annoys me. I certainly would not consider myself a lucky person, although I have completely turned my life around and experienced amazing life-changing success. In fact, for a long time I considered myself UNlucky (ie "marked by adversity or failure"). Call it luck, circumstances, or a string of making the better of any two less than good choices. There have definitely been things completely out of my control along the way though. Getting hit by a string of tornadoes right in the middle of a 21-Day Challenge I was participating in, for example. I won that Challenge though, and have the "Best of Success" award hanging right here on my office wall. 😉 Luck? No. Perseverance, definitely. THAT - perseverance - would be the key to MY success. Not luck. Do you know what I did when the string of tornadoes tore right through my area, taking out power and completely blocking us in with fallen trees for close to a week, with flood waters rising all around us? I did not throw my hands up and so "Oh well, it wasn't meant to be." No. I hiked out of there, with my laptop and my two young children, over debris and muck, to the nearest phone - which happened to be at a swimming pool. I took the emergency phone off the wall, jacked in and dialed out, and completed the challenge. I was never one of those "lucky" people that had it easy, or had a comfortable life, whether by circumstances or by choices I made. A bit of both, no doubt. I'm grateful for that, because it really challenged me to create a better life. It forced me to work harder. It's because of those circumstances that I have the life and success I enjoy today. Giving up has never been an option for me. And there were two very good reasons for that. The first being that I was the sole provider for my two children and wanted more than anything to give them the life they deserved. You don't need luck, or even the right circumstances, to see success. I'm living proof of that. All you really need is sheer determination. You have to want it bad enough to push yourself through the doubts, through the moments you feel like throwing up your hands, and through the "failures" you experience along the way. And you do have to push yourself. Because no one else is going to. If anything, they're going to feed your doubts and encourage you to take the easy route in life (like them). My life has not been easy. My success did not come easy. I worked hard to achieve my goals. There's nothing special about me, by the way. I use the same "tools" as anyone else that really wants to improve their life: self discipline, planning, perseverance, etc. I constantly strive to improve my productivity and efficiency (and bottom line!) with things like Time Blocks, Time Logs, Evernote, research, practice, testing - all free things, all simple things, all things ANYone can do. It's through determination, desire, perseverance - and focus - that I found success with my business. And it wasn't just business goals I achieved, but all of the things I most wanted in life. Focus is an interesting topic, by the way. I'm not what you'd call a focused person. Or I wasn't. In fact I might go so far as to say I was, and can be, a bit scatterbrained, lol. Focus was another thing I had to TRAIN myself on. It's something I had to FORCE (through the use of Time Blocks) until it became HABIT. I'm very pleased with everything I've accomplished in my life, despite the "luck" or circumstances I had to deal with along the way. And I love helping others achieve the same life-changing success that I have myself. I am quite sure that if I could do it... then certainly, anyone can. Ready to change your "luck" and break out of your comfort zone? I would love to work with you personally to see your ideas to reality and/or to help you reach your goals. Through the end of the year you can still join my Private Brainstorming Group for only $37/month. You'll get to keep that low monthly rate for the lifetime of your membership. This is where I offer ongoing hands-on help, reviews, feedback and training for people that are ready to have a successful online business. After the New Year, you'll only be able to join under the annual ($360) or biannual ($198) subscription option. Now is a great time to see if I'm a good fit as the person that can help you finally see the success you really want! p.s. If you prefer a one-on-one Private Brainstorming Hour with me to brainstorm your business goals, or get help/feedback with your business, fill out the form on this page. Through the end of the year I'll give you $100 off the public rate of $199 - which is going up to $299 in 2014. Get your Private Brainstorming Hour now for only $99! You'll have up to six months to schedule your hour in the case that you'd like to use it when you're closer to ready. p.p.s. Another good read: Spend More Time with This Destructive Person <- Enjoy! On the other hand I'm obviously not going to quit either because here I am. I think that one common problem for people who are thinking about building their own business is the fact that they'd like to be 100% certain in advance they're going to succeed. But no-one is going to give you that kind certainty, you just have to decide for yourself you're going to do it even if you can fail. The turning point for me was realizing that I could, that I had a choice - that choice being to accept whatever life threw at me, or to keep working toward my goal *through* whatever life threw at me. It boils down to how you respond or react to your circumstances. Which again, was something I had to learn - as it's certainly not what we're generally taught! That's so very true, you make your own luck. Once a woman, who saw the great golfer Gary Player play a magnificent shot out of the sand trap into the hole, remarked that it was a really lucky shot. With a smile he replied that it may be true, but he finds the more he practice the luckier he gets. p.s. You can read about the storms here: May 2003 It was quite an experience! That post was written on day two I believe, but we had four straight days of tornadoes and straight line winds. The cabin I lived in at the time was quite secluded. As in: a 45 minute round trip just to check the mail, lol. The ones that have typically maddened me comes from those who tell you how great it is that you're succeeding and when you tell them THEY could do the same thing... they say they can't and then justify WHY they can't by saying YOU got lucky! LOL @ "who I was looking to prove wrong" 😉 Admittedly I was on a serious mission to prove myself way back then. It turned out... I did prove myself, but only to the one person that mattered: me. ! Hi Lynn, I love reading your posts, they always inspire or educate. You are a great example of perseverance, not sure how I would react after a tornado or four barged in uninvited. I can definitely relate to the negative Nancy's that constantly remind me that what I am doing online is a waste of time. But having people like you around helps remind me that misery loves company, and I need to take those negatives and use them as fuel for the fire to succeed. I have been reading Malcom Caldwell's book "Outliers", and he talks about why some people are more successful than others. It has been a great and interesting read so far. He explains how constant practice and action over time makes you better at what you do, and by continuos action open your mindset to recognize opportunities you would not have seen if you didn't put in the time that gave you the experience to recognize it. Wow - thank you Russell. 😀 I'll have to grab a copy of that book!! Hey lynn, very nice article. It was really interesting to read. Great topic. I do agree with you and Frans above. Many people miss-understand success by saying they are being lucky enough to reach their position. Behind all that, they actually work very hard for the result. When we accomplish something with years of hard work and perseverance, a comment such as "You're so lucky!" is actually a bit insulting, IMHO.